Kasco Marine Macro-Zyme Muck Pucks are great for spot treatments around docks and swimming areas to address excessive muck accumulation and water quality issues. The completely safe, non-toxic formula of beneficial bacteria will aggressively decompose the build-up of organic matter and is not harmful to aquatic life, wildlife, pets or people. 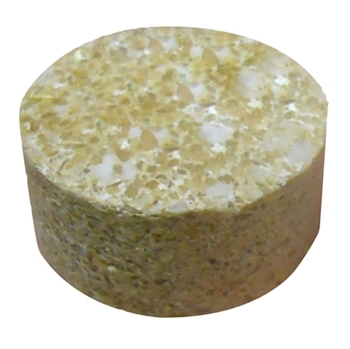 Kasco Marine Muck Pucks are approximately the diameter of a quarter and are about 1/2" tall. Each tablet will treat up to 10 ft. of bottom area and each has as much, if not more, CFU's as other bacteria products on the market. The pulverized barley binder adds micro-nutrients to kick start the bacteria and decomposition processes. Magnesium is also added as a bacteria stimulator. Muck Pucks are available in a user-friendly, pull top pail. Each pail weighs 7 lbs. and contains approximately 266 pucks. Reapplication is suggested every 2-3 weeks when water temps are above 55 F.
Macro-Zyme contains a high concentration of facultative anaerobic bacteria that rapidly reproduce and consume organic muck in your pond. This high concentration of beneficial bacteria will immediately go to work digesting carbons, fats, starches, proteins, and cellulose materials in your pond, cleaning the pond and improving the smells. It is the perfect choice for the control and elimination of sludge and foul odor in tanks, ponds, and lakes. Once introduced, Macro-Zyme quickly releases billions of friendly and beneficial bacteria and enzymes that work around the clock to clear, neutralize, and purify water. Pond treatment with Macro-Zyme is quick and easy. First, you must determine the pond capacity or water volume. To do this, you will need to know the length, width, and depth of the pond. With this info, you can use our Pond Sizing Calculator to determine the total gallons and acre feet of water in your pond and use the proper amount of Macro-Zyme. Once you have determined the total gallons of your pond, follow the label instructions for proper dosage depending on the Macro-Zyme size you have. If there is a UV Sterilizer in your water garden, you will want to turn it off for at least 48 hours after the Macro-Zyme application. Remember, Kasco Marine Macro-Zyme is a blend of facultative anaerobic bacteria and will work more effectively with the use of an aeration device like Kasco Marine's Aerating Fountains or Aerators.